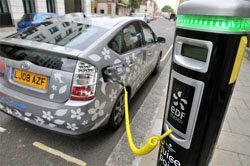 Toyota in partnership with EDF Energy have commenced the test phase of the plug-in Prius in London, expected to last about a year. The vehicle has already hit the roads in France, California and Japan for similar testing, and has a smart metre to measure charging and billing system to be used with public charging stations (juice points). We've all seen Prius's on the road and you cannot tell the difference between a standard Prius and the plug-in model except of course that the PHV's (Plug-In Hybrid Vehicles) are plastered in stickers so you cannot miss them! The results from the trial are expected to aid the improvement of Toyota's hybrid technology as well as assessing consumer acceptance of electric vehicles. The PHV differs from other electric vehicles in that it has the benefits of being a hybrid as well as being able to charge its batteries with a standard electrical plug. Over short distances (roughly 10km) it can be driven as an electric vehicle resulting in zero emissions, while over longer distances operates as a hybrid. Early indications see the car being much more fuel efficient than the current Prius, particularly over short distances as well as reducing CO2 emissions by up to 40% over standard petrol/gas cars. It is expected to be offered to fleet customers across Europe with a lithium-ion battery pack in late 2009.